Four years ago today, in 2007, while many Nashvillians were going to school or work and anticipating their evening plans for Valentine's Day, Hillwood High School graduate Eric Volz walked into a Nicaraguan courtroom as a high-profile defendant in a murder trial. The young man described as a Mexican-American in Nicaraguan court papers and as a gringo in the Nicaraguan press had a notebook and a recorder with him. No matter how the trial turned out, this was a story he wanted to remember in every detail. Now, Volz has shared those details with us. In his book Gringo Nightmare, we have Volz's version of his two years building businesses and relationships as an American living in Nicaragua, of his romantic relationship with a young local woman named Doris Jimenez, and of the aftermath of the accusations that Volz was one of the men who brutally killed Jimenez in the small clothing boutique she owned in her small town, San Juan del Sur. 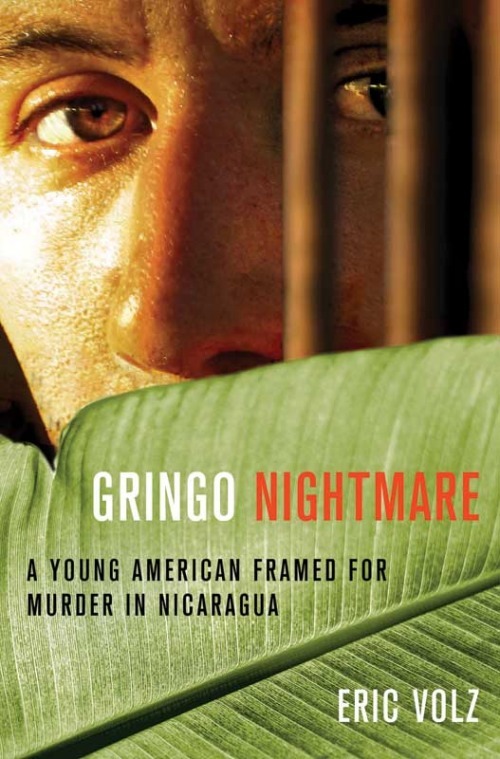 In Gringo Nightmare, Volz tells about his imprisonment, the facts of his defense, his multi-layered strategy (not limited to the courtroom), and the Nicaraguan people and personalities that held the many strings that would determine his fate. The reader has to understand that it's a hybrid story - as much of a window into Volz as it is into Nicaraguan politics and justice - but this autobiographical account of a one-time Nashville kid is still a fascinating read. Even though we know that Volz was convicted in that Valentine's Week trial, and we know that his conviction was overturned and that he was released in December of that year, seeing the harrowing events of 2007 through his eyes offers palpable suspense. The few months he had spent in custody before the trial could have easily turned into a lengthy sentence that would consume his life. If not for the herculean efforts of his support network, including his Mexican-American mother Maggie Anthony and his stepfather Dane Anthony (a Belmont professor who, like Maggie, took a leave of absence from work to focus on this case), Volz's remaining years might have been spent - or taken from him - behind the walls of a Nicaraguan prison. As for mental images, Volz paints those for us, but he also supplies via the book's web site more than 50 "exhibits" - a case file of original documents, photos, and videos. The level of detail combined with the exhibits creates more of a narrative of why Volz thinks he was framed, as opposed to why he thinks his ex-girlfriend was killed. There is simply so much more in Gringo Nightmare about the web of national and international scheming that Volz suspects was behind his imprisonment, and how Volz himself found it necessary to contribute to that scheming to in his campaign for freedom. Maybe that difference in emphasis between the crime and the aftermath is simply a result of the crime being simple and the aftermath being complex. It's also because a man professing innocence should not know too much about the crime of which he is accused. Readers are going to be naturally curious, however, to find out what actually happened - who killed Doris Jimenez, and why. Oddly, the only full-length, hearsay account of an admission of the crime is buried in the final quarter of the book, without an obvious chapter or even section heading to alert the skimming reader that it is there. Also hidden is the most convincing, condensed argument for Volz's innocence: the letter penned by one of the appeals court justices who ruled for Volz's freedom, available to the reader only by punching in the number for Exhibit 50 on the Gringo Nightmare web site - and even then, the letter is in its original Spanish, untranslated. Gringo Nightmare is best enjoyed as something other than a criminal case file into the original tragedy, which was the death of Doris Jimenez. Volz's book is for those who want to hear his story, in the words of the man who was accused of such a horrid crime in a foreign country. For anyone who wants to be a fly on the walls of Nicaraguan jail cells, hospital rooms, American embassies and other very real places - like a San Juan del Sur courtroom on the 14th of February - Gringo Nightmare is your passport. Read HispanicNashville.com's previous coverage of Eric Volz here.